Vold(Reserve Marine, Iraq Vet) adds that antiwar rhetoric sometimes implicitly portrays soldiers as dupes on a fool's errand. "We volunteered to go to Iraq. The guys over there, who know the situation best, are re-enlisting in great numbers. Most of the guys I served with think this is the best thing America has done in our careers." How did the Sheehan protest play in Iraq? Yesterday, I asked Vold's friend, Lt. Col. James MacVarish, an adviser to Iraqi troops in Fallujah. He told me in an e-mail that the Iraqis he works with believe such protests and the press they generate "play directly to the strengths of our mutual enemy." Iraqis "are absolutely astounded," he adds, "that we 'allow' that to continue." A few days ago, he had to give his Iraqi colleagues an hourlong civics lesson on freedom of the press. Hey guys, check this article out. It is a great article on the promise of adult and umbillical cord stem cells (which doesnt destroy life) and shows the real problems and actual lack of interest in Embryonic stem cells (which in my, and many others opinions, destroys life, after cloning it; 2 bad things) There is a lot of stuff in the article (short read though) I wont outline, but there is a story of adult stem cells helping a 20 yr parapeligic (sp?) regain feeling and limited mobility in 40 days, and some unveiling of Embryonic Stem Cell myths. Check it out, its an important issue. "Republicans are dealing with a string of ethical issues along with Iraq, Hurricane Katrina and hopeful Democrats." The only substantial issue from this link not related to death and destruction is the ethical issues. Listing these three thing right in front of Hopeful Democrats shows the I-hope-Bush-fails mentality that drives the left's conception of victory. If Bush fails in Iraq, ie more violence and faltering democracy, Dems win. If body count and scale of disaster up in hurricane areas, Bush loses and Dems win. Essentially the NYTimes is correlating death and destruction to victory for the Democrats. Does that make sense to anyone. That defeatest tone leaves many people disgusted with the left, and they arent going to win elections with such negativity. Clinton won by saying we can do better, and here is how. I havent seen that yet, and dont expect to.
" The protests were largely sponsored by two groups, the Answer Coalition, which embodies a wide range of progressive political objectives, and United for Peace and Justice, which has a more narrow, antiwar focus . "The name of the reporter on this story was Michael Janofsky. I suppose that it is possible that he has never before come across 'International ANSWER,' the group run by the 'Worker's World' party and fronted by Ramsey Clark, which openly supports Kim Jong-il, Fidel Castro, Slobodan Milosevic, and the 'resistance' in Afghanistan and Iraq, with Clark himself finding extra time to volunteer as attorney for the génocidaires in Rwanda. Quite a 'wide range of progressive political objectives' indeed, if that's the sort of thing you like. However, a dip into any database could have furnished Janofsky with well-researched and well-written articles by David Corn and Marc Cooper--to mention only two radical left journalists--who have exposed 'International ANSWER' as a front for (depending on the day of the week) fascism, Stalinism, and jihadism." "I'm sorry, but I can respect criticism of the conduct of this war. In fact, I find it hard to respect those who refuse to subject the conduct of this war to constructive criticism. But I cannot respect the organizations and agenda that pollute such legitimate criticism, or their fellow-travelers. Anyone who attends rallies organized by International ANSWER deserves no quarter and no hearing. And the notion that abruptly abandoning the beleaguered Iraqi people to the tender mercy of Jihadists is somehow 'progressive' boggles the mind. As Hitch observed of the motley crew in Washington last weekend: 'Was there a single placard saying, 'No to Jihad'? Of course not. Or a single placard saying, 'Yes to Kurdish self-determination' or 'We support Afghan women's struggle'? Don't make me laugh.'" Columbia Journalism Review says ANSWER is affiliated with the World Workers Party, which "was started as an offshoot of the Communist party in the late 1950s, and it supported not only Mao's Cultural Revolution but also the Soviet repression of Hungary. Basically a bunch of Neo-Stalinists, it has continued to revere that Soviet dictator, in spite of his murderous purges, has supported North Korea, and has praised a whole series of dictators who ran ostensibly socialist regimes, from Saddam Hussein to Slobodan Milosevic...There is no reason to avoid this information." The signs of erosion on our campuses are undeniable, whether we examine declining test scores, spiraling costs, or college graduates' ignorance of basic facts and ideas. In response, our academic leadership is not talking about a more competitive curriculum, higher standards of academic accomplishment, or the critical need freely to debate important issues. Instead, it remains obsessed with a racial, ideological, and sexual spoils system called "diversity." Even as the airline industry was deregulated in the 1970s, and Wall Street now has come under long-overdue scrutiny, it is time for Americans, if we are to ensure our privileged future, to re-examine our era's politicized university. With reports coming out of New Orleans of a much lower death toll, and the lies about total chaos in the Convention center, Superdome and streets of NO being exposed, the MSM + Fox (main stream media, networks plus latimes, washpost and nytimes) is beginning to realized how badly it screwed up. Turns out my giving the media some blame was justified after all, so HA to those of you who said it was the same old right wing tactic. The 24-hour news cycles fed upon these unsubstantiated rumors, turning them into fact. This led to people believing that the situation was more desperate than it was, and that people's immediate security was at risk, when in reality they just lacked food, water and medicine. (Which tends to happen when your city leaves you behind for a Cat4 hurricane) I hope other MSM outlets come out and apologize like the LaTimes is doing. Maybe some of you saw the College Dems with a kiosk in Trabant today. I did and stopped to pick up their flyer. It was all about Bush and how he is destroying the enviroment. While Republicans and Democrats may disagree on energy and enviromental policy, some of the Left's arguements are unfounded and simply hypocritical. But, as Peter Huber and Mark Mills remind us in a book ("The Bottomless Well: The Twilight of Fuel, the Virtue of Waste, and Why we will Never Run out of Energy") considerably less self-indulgent than Miss Fonda's, the substitution has been outrageously wasteful. It takes four tons of coal to provide the power needs of one inhabitant of Chicago's Lake Shore Drive for a year. A few ounces of enriched uranium could cover the same need. There is also the damage to the environment. The central hypocrisy of the green movement in our era is that anti-nuclear policy has driven the US to use the hydrocarbon fuels so much opposed by the anti-global warming movement. Or, as Mr. Huber puts it: "If we had built all the plants that were in the pipeline at the time of Three Mile Island, we would have reduced current coal combustion sufficiently to satisfy the Kyoto treaty." In pretty much the rest of it, they complain on two ends. They call for better cheaper energy and lament what they view as enviromental loss at the same time. While both sides are searching for a way to meet energy needs, the Dems do not offer oppurtunity, just contradictory rhetoric. Well I'm glad to hear that she is now a scientist. The unknowns about Mr. Roberts's views remain troubling, especially since he is being nominated not merely to the Supreme Court, but to be chief justice. That position is too important to entrust to an enigma, which is what Mr. Roberts remains. . . . If the test were legal skill alone, Mr. Roberts would certainly pass. But the Senate and the American people have a right to know whether he would use his abilities to defend core rights and liberties, or to narrow them. . . .
Over days of testimony, he dodged and weaved around many . . . critical legal issues. On abortion, church-state separation, gay rights and the right of illegal immigrants' children to attend public school--all currently recognized by the court--he asks to be accepted on faith. That just isn't good enough. . . . If he is confirmed, we think there is a chance Mr. Roberts could be a superb chief justice. But it is a risk. We might be reluctant to roll the dice even for a nomination for associate justice, but for a nomination for a chief justice--particularly one who could serve 30 or more years--the stakes are simply too high. Senators should vote against Mr. Roberts not because they know he does not have the qualities to be an excellent chief justice, but because he has not met the very heavy burden of proving that he does. While members of the Senate Judiciary Committee droned through Ruth Bader Ginsburg's hearings last week, the nominee could have been forgiven for thinking, Don't scoff, hang on a little longer and you're in. Endure she did, showing not only knowledge, but also the patience and courtesy befitting a justice of the highest court. No thanks to the committee, the hearings displayed the workings of a focused legal mind. She dwarfed not only her questioners but all the recent nominees to the Supreme Court she will soon join. Fortunately the senators realize this much: She deserves speedy confirmation. Judge Ginsburg--teacher, women's advocate and for 13 years a member of the U.S. Court of Appeals in Washington--outclassed those entrusted to advise and consent on her nomination to replace retired Justice Byron White. Fittingly, most of the senators admitted they were not in her league, although the chairman, Joseph Biden, and other preening members insisted on their own shows, largely in the form of erratic questions. . . . While the politicians repeatedly pressed for bottom lines on particular issues like the death penalty and gay rights, Ms. Ginsburg asked to be judged as a judge, not as an advocate. Senators who could not be educated yielded anyway--to the reality that Judge Ginsburg enjoys overwhelming Senate support. Change "Ginsburg" to "Roberts," "she" to "he," "the chairman" to "Delaware's premier windbag," and so on, and this could very easily be an editorial about last week's hearings. So what's the difference? Could it have anything to do with the fact that Ginsburg was nominated by a Democrat and Roberts by a Republican? True, Ginsburg wasn't up for chief justice, a position whose importance the Times exaggerates, perhaps out of Earl Warren nostalgia. (In a 1986 editorial opposing William Rehnquist, the Times rhapsodized that the chiefdom is "the noblest position in American law.") But does anyone really believe that a nominee for associate justice should "be judged as a judge, not as an advocate," while a would-be chief should be required to reveal his rulings in advance? Identify some wasteful spending in your state or (even better) Congressional District. Put up a blog post on it. Go to N.Z. 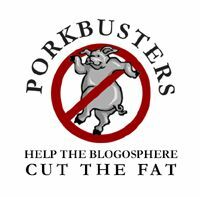 Bear's new PorkBusters page and list the pork, and add a link to your post. Then call your Senators and Representative and ask them if they're willing to support having that program cut or -- failing that -- what else they're willing to cut in order to fund Katrina relief. (Be polite, identify yourself as a local blogger and let them know you're going to post the response on your blog). Post the results. Then go back to NZ Bear's page and post a link to your followup blog post. I've been trying to find some in my home Congressional District, Pennsylvania's 8th, but have been unsucessful as of yet. Also, none for Delaware, so I am going to get on that. Any help would be appreciated! UPDATE (7:22): Found a lode of pork for Delaware just by going through Subtitle G of H.R. 3 (that gross Transportation Bill). I found $80,300,000 worth of pork (click the link and scroll), and I know there is more out there! My favorite is the one million to improve pedestrain and bicycle access here at the University of Delaware. That Roselle! Yesterday the United States Air Force celebrated its 58th birthday. The National Security Act of 1947 made a division between the U.S. Army and Air Force, and ROTC detachments across the nation took part in a morning revielle ceremony, followed by a 5k run. If you see a member of our military in uniform, remember to thank them for their service, and keep those abroad in your prayers. To say the least, its been a difficult celebration this year in the wake of Hurricane Katrina. Guardsmen and Active duty service members have been continuosuly delivering aid, starting almost immediately after the storm's wrath. With little disregard for their own comfort, service members have taken shelter at Keesler AFB, MS, to continue assisting those affected. The number of lives saved due to the brave effort by Air Force PJs is innumerable. One account can be found on the AF website, here. Regardless of the current debate raging, on whether the proper steps were taken to prepare and recover from Hurricane Katrina, lets remember that our service members and aid workers across the country, without partisan bias, have been doing their best. So Happy Birthday Air Force, hats off to you. Is it OK to gloat now? Since President Bush was elected, a favorite criticism from Democrats and other liberals in this country has been that we're hated by the rest of the world because we've got this go-it-alone, simplisme cowboy running our country. Enlightened socialist leaders (particularly those in France, Germany, and Spain--aka The Axis of Weasels) have delighted in trash-talking the US and Bush while doing their best to undermine the War on Terror. * Angela Merkel defeats Gerhard Schroeder today and thus one of the back-stabbing, America-bashing members of the Axis of Weasels goes down to defeat! * I think that's it for the weasels... Oh wait, there was that vote for the E.U. constitution that Chirac wanted to win so badly--well actually the weasels lost that one too. But, hey, at least Chirac's still in office. . .for now. "Pull our troops out of occupied New Orleans"
Yes - that's really what Cindy Sheehan said. I don’t care if a human being is black, brown, white, yellow or pink. I don’t care if a human being is Christian, Muslim, Jew, Buddhist, or pagan. I don’t care what flag a person salutes: if a human being is hungry, then it is up to another human being to feed him/her. George Bush needs to stop talking, admit the mistakes of his all around failed administration, pull our troops out of occupied New Orleans and Iraq, and excuse his self from power. The only way America will become more secure is if we have a new administration that cares about Americans even if they don’t fall into the top two percent of the wealthiest. Blair, a longtime supporter of the Kyoto treaty, further prefaced his remarks by noting, "My thinking has changed in the past three or four years." So what does he think now? "No country, he declared, "is going to cut its growth." That is, no country is going to allow the Kyoto treaty, or any other such global-warming treaty, to crimp -- some say cripple -- its economy. Looking ahead to future climate-change negotiations, Blair said of such fast-growing countries as India and China, "They're not going to start negotiating another treaty like Kyoto." India and China, of course, weren't covered by Kyoto in the first place, which was one of the fatal flaws in the treaty. But now Blair is acknowledging the obvious: that after the current Kyoto treaty -- which the US never acceded to -- expires in 2012, there's not going to be another worldwide deal like it. So what will happen instead? Blair answered: "What countries will do is work together to develop the science and technology….There is no way that we are going to tackle this problem unless we develop the science and technology to do it." Bingo! That's what eco-realists have been saying all along, of course -- that the only feasible way to deal with the issue of greenhouse gases and global warming is through technological breakthroughs, not draconian cutbacks. Tech Central Station has the whole story. Condi was also there, and had some positives to say about nuclear power. Hmm... I would choose a) as would most others. The people in the news rooms know this too, so they make the right choice for their channel. What I am saying is that this often leads to a vast misunderstanding on the part of the viewer/consumer. Same goes with an average news story on Iraq in any American news paper: lead speaks of occurences of violence and death, middle passage mentions causalty numbers and recent trends, last few paragraphs speak of progress in political and military missions. As a former newspaper editor, all of this makes perfect sense. Runaway 9th Circut strikes again! A federal judge declared the reciting of the Pledge of Allegiance in public schools unconstitutional Wednesday in a case brought by the same atheist whose previous battle against the words "under God" was rejected by the U.S. Supreme Court on procedural grounds. U.S. District Judge Lawrence Karlton ruled that the pledge's reference to one nation "under God" violates school children's right to be "free from a coercive requirement to affirm God." Karlton said he was bound by precedent of the 9th U.S. Circuit Court of Appeals, which in 2002 ruled in favor of Sacramento atheist Michael Newdow that the pledge is unconstitutional when recited in public schools. Reflections of a libertarian Republican looks at this with some depth. You know, the American people amaze me everyday when tragedy's like Katrina take place. Walmart had more than 32 big rigs prepared to help 24 hours before the hurricane even hit, Budwiser sent its big rigs full of water... Rental properties have been donated to shelter evacuees, big rigs have been donated (at a large expense) for donated supplies to reach the Gulf region, and the countless volunteers from across the United States and other countries as well to take part in the relief efforts. The private corporations and private citizens proved to be spectacular given the situation. However, it was mainly "big government organizations" that failed us in many regards. FEMA is one of those such big government organizations, big beauracracy that failed to get the job done. In fact, when those walmart trucks arrived, someone from FEMA said they weren't needed (but then again i heard that on the news so you can't trust that notion completely). For years, conservatives like myself have railed against big government and big beauracracy for years to no avail. In our arguments for tax cuts we said "You can spend your money wiser than the government." This, is a perfect example. Also, in the race for Governor in New Jersey, Conservative Republicans note that the you could have a 30% decrease in property taxes, if you simply eliminated Government waste, pay-to-play, and made it more efficient. As I recall it was the Democrats who put their faith in FEMA, the Democrats who put their faith in big government, and the Democrats who wished to continue such organizations and grow them by leaps and bounds. How ironic that now they attempt to blame such organizations for their faults as well. Who knows, maybe they'll join me and support eliminating such useless government organizations? I doubt it. Liberal Democrats rail against conservatives and Republicans to no end, if only for the sake of going against them (albeit with no platform at all, or without any solutions whatsoever). I think a lot of the negative feelings about this have been caused by the 24/7 media's obsession with speed and instant results. Remember that the only really comparable hurricane aftermath, Andrew in 1992, came only a few months after the real acceptance of CNN and its 24 hour news format. Now there are close to a dozen 24/7 channels and of course the internet that live on instant action and analysis. The situation that was faced in the first 48 hours was a logistical nightmare of massive proportions. Things were being done continuously from four or five days prior to landfall and have ceased to wane one little bit. The problem was that all of this was being observed from a drinking straw viewpoint, namely cameras and reporters in New Orleans. While pictures of the destruction were being looped on TV, half of the nation was moving their people, equipment and resources to the affected area (equal to the size of the UK) as fast as possible. The first on scene were helicopters, because, well...they can fly. But most everything else was streaming to the area via convoy, and 18 wheelers and humvees can only go so fast. The intitial responsibility for emergency response is always upon the first responders, local and state authorities, but in this case nature destroyed this capability. 145 mph wind, 15 inches of rain, a 20 ft wall of ocean, and broken levees allowing millions of gallons into the below-sea-level city made the local and state response virtually impossible. Thus the seemingly empty space between landfall and the arrival of federal resources and authority. Chalk one (well maybe a couple) up for Nature in the Run column, and leave the Error column alone. THE PRESS WANTS TO SHOW BODIES from Katrina. It didn't want to show bodies, or jumpers, on 9/11, for fear that doing so would inflame the public. I can only conclude that this time around, the press thinks it's a good thing to inflame the public. What could the difference be? The link is to a CNN story about how the network has gone to court to get an order requiring the U.S. military to give it access to dead bodies so it can film them. Quite a different attitude, wouldn't you say, from the press's reluctance to show us the full horror of the September 11 attacks? Remember, too, the press' outrage when it wasn't able to shoot footage of caskets of soldiers that were flown back from Iraq. Somehow a different standard applied there, also. (2005-09-10) -- The Cable News Network (CNN), fresh from a legal triumph allowing it to televise the recovery of dead flood victims, today asked a federal judge to allow it to dig up and videotape any bodies buried in the aftermath of Hurricane Katrina. "While we were petitioning the court to cover the recovery of corpses, some victims were hastily buried," said an unnamed CNN spokesman. "Our viewers have a right to see the decaying flesh of each and every citizen who perished from lack of federal government assistance. That's why the First Amendment exists." In Katrina's wake, Wal-Mart and Home Depot came to the rescue. In time we'll find out what went wrong after Katrina hit, but it's not too early to start drawing attention to what went right. Near the top of any list should be the remarkable response of the business community. It's had a lot to do with the relief effort's successes. The straightforward generosity of the corporate sector has been well reported. By last count, donations had exceeded $200 million. Besides cash, companies have handed out free drugs, suspended finance payments on cars and mortgages and helped emergency personnel with equipment. As interesting, though, has been the application of corporate best practices--from supply-chain management to logistics--to a natural disaster. The private-sector planning began before Katrina hit. Home Depot's "war room" had transferred high-demand items--generators, flashlights, batteries and lumber--to distribution areas surrounding the strike area. Phone companies readied mobile cell towers and sent in generators and fuel. Insurers flew in special teams and set up hotlines to process claims. This planning allowed the firms to resume serving customers in record time. Katrina shut down 126 Wal-Mart facilities; all but 15 are now open. Entergy, the power company for 1.1 million households and businesses that lost electricity, had restored electricity by yesterday to 749,000 customers, including areas of flooded New Orleans. Businesses offered near-instant support to their own employee-victims. Staff set up hotlines and began tracking down missing workers. Thousands of workplace victims were provided with places to stay, promises of continued pay and even offers of replacement jobs elsewhere in the country. At the heart of the corporate response was a stunning array of advanced communications networks that kept firms in touch and coordinating. Following on last year's tsunami aid effort, the Business Roundtable had by August of this year arranged for each of its 160 member companies to designate a disaster relief point man. These folks were in place and ready to help before Katrina made landfall. The U.S. Chamber of Commerce, through its non-profit Center for Corporate Citizenship, became a clearinghouse, fielding calls from many of its 3,000 state and local organizations and compiling lists of needed supplies. By the weekend the Chamber's CCC was turbo-charging a new computer program, designed by tech firm i2, which served as a kind of bridal registry for needed relief supplies. Each donor company indicated what order it would fill, avoiding duplication or delay. IBM got to work on a computerized job bank to help place those who'd lost work. The American Trucking Association set up a Web site to update everyone on road conditions. Companies then focused on doing what each did best. In some cases it was simply ramping up operations, as with Black & Decker, whose employees worked Labor Day weekend to churn out extra generators. In other cases, it was firms using their modern logistical skills to get into hard hit areas. FedEx and other delivery companies used computer systems with designed-in flexibility to reroute vehicles and adjust flights to get in aid. FedEx has already moved more than 100 tons of relief supplies. Wal-Mart mined its vast databases of past purchases to compile lists of goods most desired after a hurricane. (Among the top items? Strawberry pop tarts.) Because of its advance logistics planning, the big retail chain was able to quickly move in to devastated areas with mini Wal-Marts to hand out goods. Other firms leveraged similar supply-chain capabilities; Pfizer dispensed pharmaceuticals via Wal-Mart and other retailers. "What companies do is solve problems," says Johanna Schneider, an executive director at the Business Roundtable. Granted, a FEMA is never going to operate with the agility of a FedEx. FedEx and the others perform at this level 24/7; that's the nature of competition. That said, surely there are lessons here worth learning and attempting to transfer to the public sector. And we don't mean three years from now after another round of reassessment and performance reviews. The challenge of reconstruction is now. It wouldn't hurt if the responsible public agencies asked the private participants in the rescue operation for some pointers on getting the next job done on budget and on time. As the full horror of Hurricane Katrina sinks in, thousands of desperate columnists are asking if this is the end of George Bush's presidency. The answer is almost certainly yes, provided that every copy of the US Constitution was destroyed in the storm. Otherwise President Bush will remain in office until noon on January 20th, 2009, as required by the 20th Amendment, after which he is barred from seeking a third term anyway under the 22nd Amendment. You really need to read the whole thing. It is a masterpiece. Army Corps Funding in La. Wesley Pruden, editor in chief of The Washington Times. George W. finally gets it -- in more ways than one. The tardy president was back on the Gulf Coast yesterday, bucking up the spirits of the damned and stiffening the resolve of the slackers. He's getting it as well from his critics, many of whom can't believe their great good luck, that a hurricane, of all things, finally gives them the opening they've been waiting for to heap calumny and scorn on him for something that might get a little traction. Cindy Sheehan is yesterday's news; she couldn't attract a camera crew this morning if she stripped down to her step-ins for a march on Prairie Chapel Ranch. The vultures of the venomous left are attacking on two fronts, first that the president didn't do what the incompetent mayor of New Orleans and the pouty governor of Louisiana should have done, and didn't, in the early hours after Katrina loosed the deluge on the city that care and good judgment forgot. Ray Nagin, the mayor, ordered a "mandatory" evacuation a day late, but kept the city's 2,000 school buses parked and locked in neat rows when there was still time to take the refugees to higher ground. The bright-yellow buses sit ruined now in four feet of dirty water. Then the governor, Kathleen Blanco, resisted early pleas to declare martial law, and her dithering opened the way for looters, rapists and killers to make New Orleans an unholy hell. Gov. Haley Barbour did not hesitate in neighboring Mississippi, and looters, rapists and killers have not turned the streets of Gulfport and Biloxi into killing fields. The drumbeat of partisan ingratitude continues even after the president flooded the city with National Guardsmen from a dozen states, paratroopers from Fort Bragg and Marines from the Atlantic and the Pacific. The flutter and chatter of the helicopters above the ghostly abandoned city, some of them from as far away as Singapore and averaging 240 missions a day, is eerily reminiscent of the last days of Saigon. Nevertheless, Sen. Mary Landrieu, who seems to think she's cute when she's mad, even threatened on national television to punch out the president -- a felony, by the way, even as a threat. Mayor Nagin, who you might think would be looking for a place to hide, and Gov. Blanco, nursing a bigtime snit, can't find the right word of thanks to a nation pouring out its heart and emptying its pockets. Maybe the senator should consider punching out the governor, only a misdemeanor. The race hustlers waited for three days to inflame a tense situation, but then set to work with their usual dedication. The Revs. Al Sharpton and Jesse Jackson, our self-appointed twin ambassadors of ill will, made the scene as soon as they could, taking up the coded cry that Katrina was the work of white folks, that a shortage of white looters and snipers made looting and sniping look like black crime, that calling the refugees "refugees" was an act of linguistic racism. A "civil rights activist" on Arianna Huffington's celebrity blog even floated the rumor that the starving folks abandoned in New Orleans had been forced to eat their dead -- after only four days. New Orleans has a reputation for its unusual cuisine, but this tale was so tall that nobody paid it much attention. Neither did anyone tell the tale-bearer to put a dirty sock in it. Condi Rice went to the scene to say what everyone can see for himself, that no one but the race hustlers imagine Americans of any hue attaching strings to the humanitarian aid pouring into the broken and bruised cities of the Gulf. Most of the suffering faces in the flickering television images are black, true enough, and most of the helping hands are white. Black and white churches of all denominations across a wide swath of the South stretching from Texas across Arkansas and Louisiana into Mississippi, Tennessee, Kentucky, Alabama and Georgia turned their Sunday schools into kitchens and dormitories. In Memphis, Junior Leaguers turned out for baby-sitting duty at the city's largest, most fashionable and nearly all white Baptist church, cradling tiny black infants in compassionate arms so their mothers could finally sleep. The owner of a honky-tonk showed up to ask whether the church would "accept money from a bar." A pastor took $1,400, some of it in quarters, dimes and nickels, with grateful thanks and a promise to see that it is spent wisely on the deserving -- most of whom are black. The first polls, no surprise, show the libels are not working. A Washington Post-ABC survey found that the president is not seen as the villain the nutcake left is trying to make him out to be. Americans, skeptical as ever, are believing their own eyes. Because they are worried that the Katrina disaster will push aside Iraq and Cindy Sheehan from the news, and Americans will rally behind Bush (which will probably lead to a upward spike in his approval ratings) when he asks for their support to help the refugees in Louisiana. So the liberal media and other dems are pre-emptively trying to poison the atmosphere by engaging in the blame game and partisan politics. See Robert Kennedy. See Randi Rhodes. See Kanye West. See CNN. They want to see Bush fail so that they will reap the benefits in the 2006 midterm elections. Thousands of students affected by Katrina were forced to improvise on their fall-semester plans, and many were inquiring about taking classes elsewhere. Dozens of colleges around the country said they would help displaced students find spaces, and extended deadlines, waived application fees and promised to streamline paperwork. The federal Education Department also pledged to relax student-loan guidelines to help transferring students. The American Council on Education estimates 75,000 to 100,000 college students in the New Orleans area have been affected by the storm, and close to three dozen universities in the region have been seriously damaged. My heart goes out to all of them as we start our fall semester.